[Don't know what a term means in this blog post? Isabel Myers, with cues from Jung, created a set of rules that outline how the mental function-attitudes "rank" from most preferred to least preferred in our consciousness. Each of the 16 Types have a different order of the FAs (function-attitude) that all follow this rule (which I will not describe here but may post someday). One could easily stop there; it's pretty complex. But Isabel's model doesn't describe how the position of the FA affects its expression. How does the FA of Ni (introverted iNtuition) look different when in the 1st position (classically called the "Dominant") as opposed to the 3rd (simply "Tertiary") or the 7th (a horse with no name)? There were few descriptions; and those that did exist concentrated on the top four: the only ones we supposedly had any conscious ability to access. John Beebe created a "role model" of the hierarchy of archetypes - an architecture of these 8 ranked FAs with rules for their behavior based on 8 classic archetypal roles. Those roles are described at TypeInDepth. The table below shows how Isabel's rankings of FAs (the "Actors") meet Beebe's archetypal "Roles" resulting in what I call 64 "Characters." Each MBTI type has 8 Actors (the FAs) and 8 Roles (the archetypes) = 64 possible Characters. 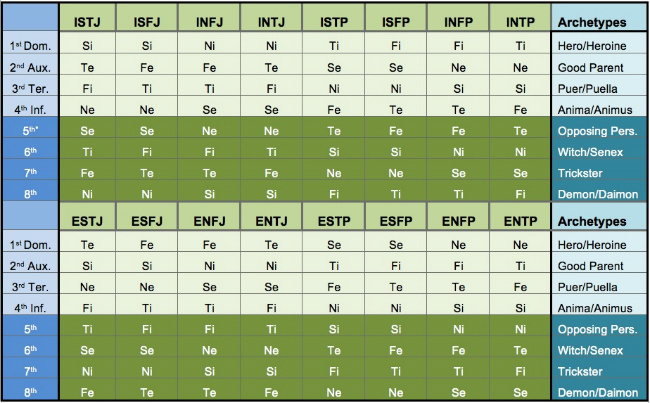 The "Equity Union rules" of placement (the 16 MBTI Types) of the FAs restrict and result in 16 possible ensemble "Casts" as detailed in the Table below (again, thanks to TypeInDepth). This is like the ultimate acting troupe - any Actor can play any Role and they're Cast according to the Equity approved Script that is your MBTI Type. So now what we have defined our terms and outlined the background, we come to the real point of the post. When I first encountered Beebe's model, I immediately grokked it as correct. Something about it clicked, made sense, felt right and was elegant in its simplicity - essentially my iNtuition had a field day with it, and my Feeling judged it Good; but - my brain never stops there. I was left with "why does it feel right?" and "how did he come up with this?" I personally don't need empirical logic and science and statistical analysis to go with my iNtuition in the heated flush of discovery, but ultimately I like to know "why I believe in what I do" - and I like to have my ducks in order when I ultimately I have to present to those who may like logical support. At the time, I (and most of the world) lacked any source material of Beebe's development model. So I had to figure out the "math" myself. What follows is my "math." Analytical psychology (which, unfortunately, includes Freud) was basically concerned with the differences between the Conscious Self and the UnConscious Self. Jung realized there were levels of complexity to this basic division, but it all starts from there. Basically our conscious self is the part that we have accepted as agreeable, preferred, right, true, correct and good. We embrace it (in a philosophical ouroboros, one can ask, "do we like our conscious self because it's good?" or "do we think our conscious self is good because it's conscious?"). So that leaves everything that we find disagreeable, rejected, wrong, false, incorrect and bad. Normally we just find those traits in others outside of our Self - but Jung states that we have these within us too - just way down deep in ourselves. We just try to suppress them, say No! like a petulant two year old or ignore them altogether. The Conscious self can be summarized as our Positive side - agreeable, preferred, right, true, correct, good. The UnConscious self can be summarized as Negative - disagreeable, rejected, wrong, false, incorrect, bad. Jung's first "AHa!" when developing his model of Psychology (and what he thought, at first, was enough to describe the differences in everybody) was that of Attitude that had to do with directionality of attention. Sound a lot like our rules for Conscious and Unconscious, don't they? And there's correlation. Introversion is frequently stated to be the Attitude we invoke in order to access the Unconscious. Our Consciousness is what we use when we're being actively engaged with ourselves and the world. Sure we can prefer Introversion, resulting in a seemingly disengaged and reflective personality type, but ultimately we use Extraversion as well. We all use both Attitudes. Let's set aside Attitude for a little bit and move onto another concept and some new terms. In order to create this division in our Psyche, our Self has used Judging - the Jungian term for the mental function of decision making and analysis of various kinds. The descriptions we used for conscious and unconscious (agree/disagree, yes/no, good/bad) are all decisions we've made about our Psyche. The basic division of Judging is that between the Positive and Negative. Judgment can be further broken down into two kinds: Thinking and Feeling. Thinking is logical, devoid of human value, and can basically be boiled down to 2 answers: Yes or No. Feeling is empathy/sympathy, based on human values, and basically can be boiled down to Good or Bad. Now let's add Attitude back in the table. Part Two will take these concepts that we've defined and apply them to Beebe's model to show how the Archetypal Roles follow this "psycholgical type math" or what I called Archetypeture.